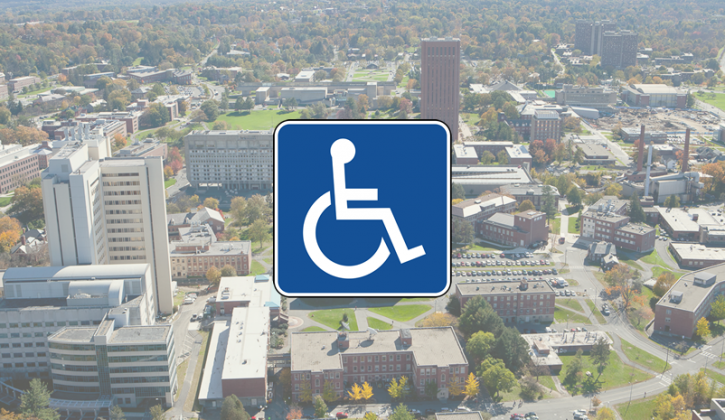 The University of Massachusetts Amherst provides ADA reserved accessible parking. Use our interactive Parking Map to locate reserved accessible parking. Click the Layers icon on the top-left of the map, and select reserved accessible parking. To better serve our customers with state-issued disabled placards or license plates, Parking Services requires them to register with our office and provide vehicle information. Vehicles displaying a state-issued disabled placard or license plate may park in any marked Reserved Accessible Space, any regular, unreserved space, or any parking meter at no charge. All vehicles, regardless of disabled placards or plates, must pay when utilizing the Campus Center Parking Garage. If you require Proximity Parking not exceeding one semester, you must have the Proximity Parking Needs Application filled out by your doctor and submit it to Parking Services. Anyone who requires permanent Proximity Parking must register with Disability Services, Room 231, Whitmore Administration Building, tel. (413) 545-0892. Disability Services reviews each case and, in conjunction with Parking Services, determines the appropriate parking assignment. To request temporary Proximity Parking during the third trimester of pregnancy, please provide Parking Services with a doctor’s note including the expected due date. Customers with permanent disabilities who have personal care attendants must register with Disability Services, Room 231, Whitmore Administration Building. (413) 545-0892. Disability Services will send a list of attendants and their needs to Parking Services. Parking Services will then determine the most appropriate parking assignment. Special Transportation Services (SpecTrans), a department of UMass Transit Services, offers campus community members with mobility impairments free transportation including mobility device lift-equipped van service. Contact SpecTrans at (413) 545-2086 or transit [at] umass.edu.